We owe everything we have to the Sun. If it weren’t for the Sun, there’d be no life on Earth. The relationship between Sun and Earth has gone back for 4.6 billion years, and should last for another 7 billion years or so. 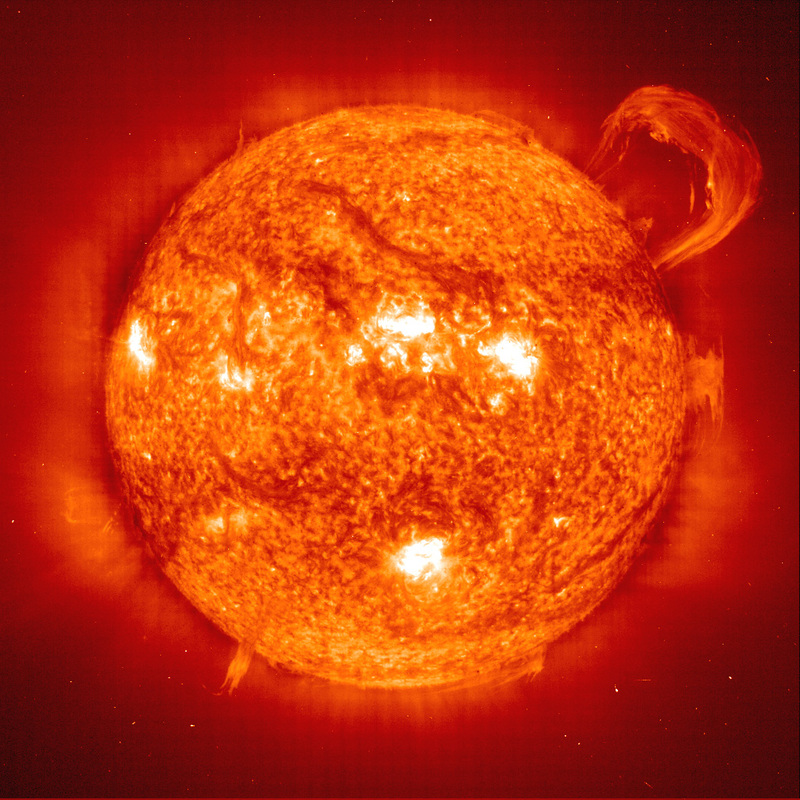 As you probably know, the Sun is just a giant sphere of gas. At the core of the Sun, huge quantities of hydrogen are squished together in the intense pressure and temperature of this extreme environment. Hydrogen is converted to helium, and this reaction releases a tremendous amount of energy. How much energy? Astronomers calculate that there are 600 million tons of hydrogen fused every second. 4 million tons of matter is converted to pure energy every second. This releases 3.86Ã—1026 joules of energy every second. Although most of this energy heads off into space, plenty still falls onto the Earth. In fact, there’s enough energy coming from the Sun to deposit 342 Watts of energy onto every square meter of the Earth (averaged over the year, over the whole planet). From our perspective, Sun and Earth go hand in hand. This energy from the Sun heats up the planet, preventing us from cooling down to near absolute zero temperatures of space. Our atmosphere traps the energy as heat, keeping the whole planet a nice comfortable temperature. Plants have been soaking up this energy for millions of years. When you burn gasoline in your car, it comes from oil, which is energy from the Sun that planets have been storing for millions of years. Sun and Earth are locked in a gravitational dance as well. The mass of the Sun is 2 Ã— 1030 kilograms. This is enough to reach out across space and keep the Earth (and the rest of the planets) locked in orbit around it. We even experience tides from the gravity of the Sun. Were you wondering how far away the Earth is from the Sun? And the Sun isn’t always trying to help us. Sometimes it’s throwing monster flares at us as well. Here’s NASA’s Solar System Exploration Guide on the Sun. And here’s the homepage for NASA’s STEREO mission, which is taking amazing pictures and videos of the Sun.